(6): p(n) = Exp(-nave) (nave)n / n! where W is in eV and D is in Gy. For example, if 5 x 104 Gy is required to inactivate 63% of a dry virus layer, the effective molecular weight of the target is 1.1 x 105 dalton. was proposed for mammalian cell damage in the theory of dual radiation action. Parameter-a measures the probability of "one-hit" damage and parameter-b measures the efficiency of "two-hit" damage. Experimental values of a/b for mammalian cells are much larger for fast neutrons than for x-rays. This result suggests that a single neutron hit is more lethal than a single photon hit. Although target theory is a useful model for characterizing biological radiation damage, this phenomenological theory does not lead to definitive information about the actual damage mechanisms. Comparisons between D37 for different types of radiation are quantified by the RBE. 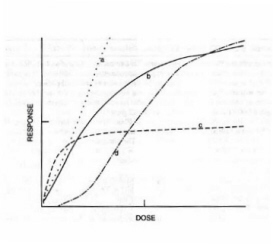 This dimensionless quantity is proportional to the inverse of the dose leading to a given biological effect under identical conditions for different types of radiation. RBE is usually scaled to gamma-rays. LET is an important determinant of RBE. The passage of high LET radiation (e.g., protons) through a target has a higher probability for generating an ion-pair within the target than low LET radiation (e.g., x-rays) owing to the denser ionization track. Thus, RBE should increase with increasing LET. However at very high LET, multiple ionisations may be wasted within the target and the RBE decreases. 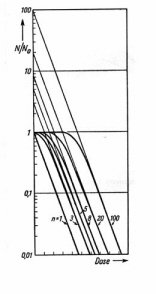 The track segment model of Howard-Flanders was an early theoretical approach to the effect of LET on radiation sensitivity. The analysis for the one-hit case (n = 1) shows that the radiation sensitivity S decreases from low to high LET because the extra hits generated by high LET radiation are wasted. However for n > 1, S increases to a peak value that depends on the hit number n and then falls off at higher LET. Radiation inactivation of enzymes, viruses, and haploid cells may follow a one-hit model, while diploid cells are expected to be act as two-hit targets. Indirect action in aqueous and biological systems involves the radiation chemistry of liquid water. The primary products of water radiolysis are generated with a non-uniform spatial distribution owing to the inhomogeneous distribution of the initial energy loss. The analysis of the early-time regime is based on spur theory. Those primary species that survive spur reactions eventually attain a random spatial distribution in the medium. The later-time regime obeys conventional homogeneous reaction kinetics. Homogeneous kinetics may not be applicable when a small intermediate, e.g., a free radical, reacts with a large biological target such as a macromolecule, cell organelle, or whole cell, because diffusional processes cannot maintain a uniform concentration of the reacting species. This situation has been modeled with large target reaction kinetics. The kinetics of chemical reactions are described in terms of molecular order and reaction order. Molecular order refers to the actual number of species that take part in a chemical reaction. Virtually all chemical reactions in water take place between two reacting species, one of which may be a solvent molecule. For example, the reactive species in proton dissociation are an acidic molecule or ion and an adjacent water molecule. Reaction order refers to the dependence of the reaction rate on the actual concentration of the reactants. The rate of a zero-order reaction is constant in time, e.g., oxidation of glucose in the liver. The rate of a first-order reaction is proportional to the concentration of one reactant, e.g., dissociation of an enzyme-substrate complex. The rate of a second-order reaction is proportional to the product of two reactant concentrations or the square of one reactant concentration. Fast reactions of small free radicals in the liquid phase are usually of second-order. Third-order reactions occur in the gas phase because a "third body" is required to conserve energy and momentum. An inert gas or the wall of the containing vessel may serve as a third body. A bimolecular reaction may appear to be of first-order if one reacting species is present in large excess, e.g., proton dissociation. This type of process is referred to as "pseudo-first order". The proportionality constants in kinetics equations are referred to as rate constants, although their numerical values may depend on the temperature, pH, and ionic strength. The rate constant of a very fast reaction may vary in time during a short period after a species is generated because diffusion may not be able to keep up with depletion of the primary species. This effect is closely related to spur theory. The general solution is easily found for different starting amounts of A and B. A special case obtains if [B] >> [A]. The reaction is then of pseudo-first order and follows Equation (15) with k1 replaced by k2[B]. Figure 12 depicts the dose-response curves for zero-order, first-order, and second-order reactions. where D is the diameter of the molecule and h is the viscosity of the medium. 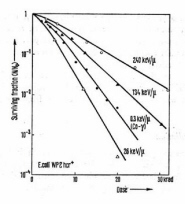 (The viscosity of water is 1 poise at 20.2EC; 10 poise = 1 J-s/m3). A typical calculation for bimolecular reactions of hydroxyl radicals in water gives k (OH+OH) = 2 x 109 liters/mol-s which is in good agreement with experimental measurements. Various techniques have been devised to measure the rate of fast chemical reactions. In pulse radiolysis a system is irradiated with an intense pulse of ionising radiation, typically < 1 ns in duration. A LINAC is a practical source of fast electrons and gamma-rays. Each radiation pulse generates a non-equilibrium concentration of the short-lived intermediates which can be identified and followed in real time by making fast optical absorption measurements. A typical experimental arrangement is depicted in Fig.15. In kinetic spectrophotometry the optical transmission of the irradiation cell is monitored continuously at selected wavelengths. This technique makes it possible to follow the disappearance of a parent substance and the buildup and decay of intermediate products. 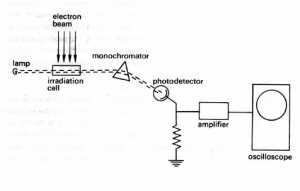 In an alternative pulse-probe technique the entire absorption spectrum of the irradiated system is measured at a selected short time delay after the irradiation pulse using a broad-spectrum light flash as the spectral source. Pulse radiolysis studies have led to the identification of many short-lived intermediates and measurements of reaction rate constants. The competition method is a continuous irradiation technique in which the dependence of a product yield on the concentration of an added solute leads to relative rate constants. The competition method is used also in conjunction with pulse irradiation methods, in which case the effect of an additive on the decay of a transient product is measured in real time. where GR is the G-value for production of the primary radicals, kA is the bimolecular rate constant for primary radical reactions with the additive, [T]0 is the initial concentration of targets, and b = 1.038 x 10-7 is a numerical factor for D37 in Gy. For a constant target concentration, Eq. (19) leads to the dependence of D37 on the additive concentration and, therefore, the ratio kA/kT. D37 can be measured for any property of the target that is affected by the primary radicals. The competition method is useful for relative measurements of different free radicals with biological targets. The term in (..) is the same as diffusion-limited rate constant for bimolecular reactions of an uncharged radical; see Equation (17). Equation (27) is the same result as calculated by homogeneous reaction kinetics in which reactions of radicals with targets compete with scavenging. In the other limit of a very large target (RT >> dR). Equation (26) shows that 1/D37 depends on RT2dR. This is result differs from the results of homogeneous reaction kinetics which lead to a linear dependence of S on RT. The reactions of the primary water radiolysis radicals generated in the cytoplasm with chromosomal DNA are an important application. The same analysis can be used for reactions of short-lived photochemical species with large targets such as singlet molecular oxygen, in which case dR = /2at where t is the singlet oxygen decay lifetime.